ESCONDIDO, CA-The Emmanuel Faith Community Church (EFCC), based here, sought to reach out to younger congregation members through a church service it could call its own, with features that would include multimedia and modern rock-styled worship music. As a result, an already-in-progress chapel construction project, originally designed for weddings and funerals, instead transformed into a multipurpose venue capable of supporting everything from traditional string quartet concerts and choral ensembles to multimedia-driven events. Recognizing that sound and visuals were crucial to the goal, EFCC charged Tom Wade, its media technical director, with the task of assembling the necessary equipment. TCS Audio loudspeakers are suspended over the stage in Emmanuel Faith Community Church's new chapel, which now brings multimedia and modern worship music to the community. After a protracted search, Wade selected a sound reinforcement system centered around loudspeaker and power components from the TCS Audio catalog, and combined these with lighting and video projection systems from Electronic Theater Controls (ETC) and Mitsubishi. The new program, named Resonate, has been tremendously successful, and what started as a single Sunday service has been expanded to two services each week. "Our Resonate program incorporates modern worship music performed by a live praise band that varies in size from four to eight pieces on any given week," said Wade. "This is augmented by a video teaching segment projected onto a 12- x 10-foot screen centered above the stage area. Featuring music our younger congregation can relate to, along with large screen projection and lighting, the environment is a rich multimedia experience and it's been extremely effective for us. The facility has seating for 400 and currently we have about 600 attendees between the two services. For church members who prefer a more traditional worship experience, we offer several services each week in our Worship Center." The stage area in the refurbished chapel is 24 inches high, 28 feet wide, and 20 feet deep, with a center riser that accommodates the band's drummer. Flown roughly 22 feet above the stage floor via the integrated ATM Flyware, the main sound reinforcement system consists of dual TCS Audio TCS 1500 3-way, tri-amplified full-range enclosures and dual TCS 1800 subwoofers per side. The enclosures are arranged with the subwoofer on top and the full-range enclosure underneath and inverted so that the horn is at the bottom of the stack. This configuration, said Wade, "enabled me to obtain the broad, smooth sounding dispersion pattern I was looking for." 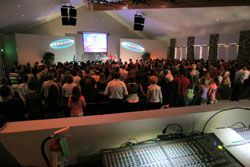 For stage monitoring, the church's setup utilizes five TCS Audio TM10x floor wedges plus a single TM115 full range enclosure that resides on the drum riser. Power for the entire system is provided by eight TCS Audio TA2400 and one TA1400 power amplifiers. Additional monitoring is provided by a Shure PSM 200 wireless in ear personal monitor system for the praise band's leader. For microphones, Emmanuel Faith uses multiple Shure SM58 cardioid dynamic vocal microphones hard wired into the console. Additionally, a Shure SLX UHF wireless system is available for use with a Countryman E6i earset microphone for dialog. The FOH position is a permanent setup in the form of a production booth with a minimal amount of equipment so as to keep the system's operation as simple as possible. In addition to an Allen & Heath GL2800 40-channel mixing console, there is also a dbx Professional 2231 dual 31-band graphic equalizer and a BSS Audio fds-336t minidrive for loudspeaker management. "We rely on volunteers to run the system," said Wade, "so keeping the setup manageable for everyone involved was a high priority." Also residing in the FOH production booth are the ETC Express 24/48 lighting control console and a projection station with a Mitsubishi XL5950U ColorView 4700 ANSI lumen projector equipped with a fixed focal point lens. An Extron DVS 406 video scaler upscales the video to XGA resolution. Projection distance from the booth to the on-stage screen is roughly 70 feet. In the few months that its new AV system has been operational, everyone at Emmanuel Faith Community Church has been extremely complimentary about the system. "We're absolutely delighted with the results we've been experiencing," said Wade. "The sound quality is excellent, and numerous congregation members have expressed their enthusiasm. I have a long-term working relationship with the TCS Audio team, and have been very impressed with the company's service and support. Combined with the lighting and projection, the results have been truly rewarding. Our new system has enabled us to make our events more enjoyable, relevant, and meaningful to all who experience them."